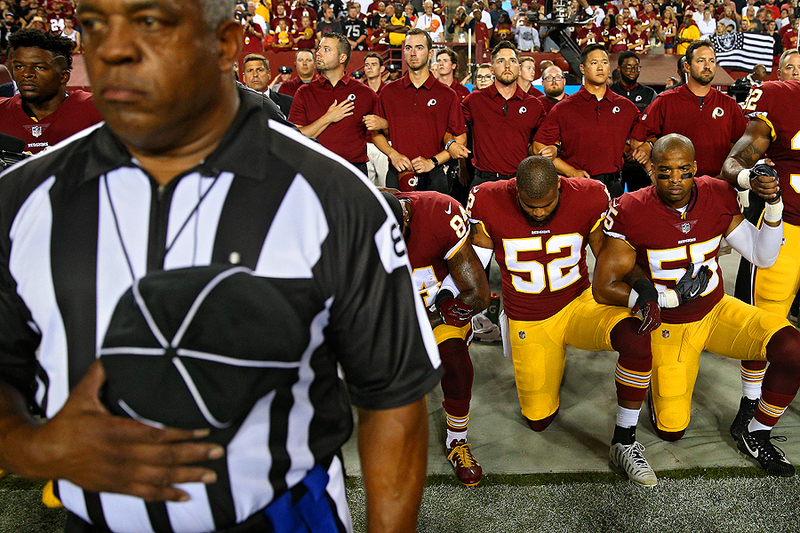 "Ryan Anderson #52, Chris Carter #55 and Niles Paul #84 of the Washington Redskins lock arms as they kneel alongside standing coaching staff and teammates during the United States national anthem before playing against the Oakland Raiders at FedExField on September 24, 2017 in Landover, Maryland." Documenting sports doesn't always mean strictly the action the field. 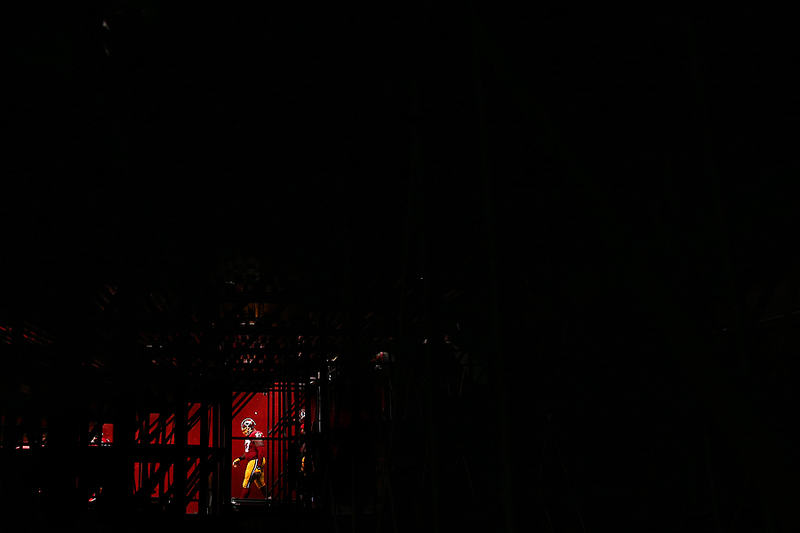 Sometimes it means photographing an on-going news story regarding: a player, a coach or even the stadium itself. And in this case, more or less, the league. Prior to week three of the NFL regular season, U.S. President Donald Trump chastised the NFL and its players publicly on Twitter regarding those who kneel during the national anthem. Because of that, more than 200 players league wide showed their solidarity by demonstrating in the form of kneeling, sitting or joining arms during the playing of the anthem. This was a known situation going into the game and we had to prepare for shooting these images at every game to help tell the story. Splitting the field with my teammate, I documented the Washington Redskins sideline - while he took the Oakland Raiders - as players, coaches, and even the team's owner, united by standing, kneeling or locking arms to show their disapproval of the President's comments. Although the game was why we photographers were there, this protest is what the world was talking about and was the real story line for the night and maybe weeks to come. 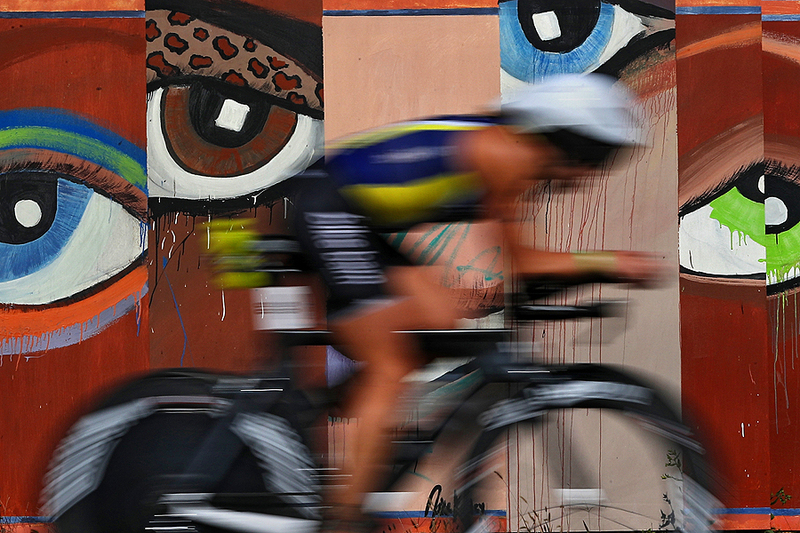 "An athlete competes in the bike portion of the IRONMAN 70.3 Women's World Championship on September 9, 2017 in Chattanooga, Tennessee." Sometimes there is no explanation of how incredible athletes can be. Having the opportunity to document the IRONMAN 70.3 World Championship was certainly one of those moments. Working in a team format, we documented both the men's and women's race which is half the distance of the the full-length IRONMAN. This race is a 1.2 mile swim, a 56 mile bike, and a 13.1 mile run which equals the obvious 70.3. And did I mention, they're doing all of this is about four hours? Unbelievable to say the least, as most non-athletes, or even the word's best, would probably be exhausted completing just one of those segments. We had a lot of fun and it was a challenge finding clean, compelling backdrops. But in the end, told the story immaculately and we're looking forward to doing it again soon. "Defensive tackle Terrell McClain #97 of the Washington Redskins takes the field for warmups before playing the against the Cincinnati Bengals in a preseason game at FedExField on August 27, 2017 in Landover, Maryland." Revisiting the same venues can be a challenge visually. How can we make this like new, fresh? That's what I am always thinking before I even get out of my car for a game. Sometimes it comes naturally. A big play. A change in the weather. Shifting light. Something that organically happens and keeps all photographers testing their skills. Yet most other times it comes from trying to find a new angle or moment. That is when an eye comes into play - not simply pressing the button when something happens in front of you. In all my years at FedExField, getting from one side to the other isn't always the quickest when not on the field. So in trying to see if I could traverse underneath the stands, I found a new picture. Now I just need to wait for the franchise player or bigger moment - which now makes the challenge even more fun.